Flow 8 - $187.99 ea. The Flow 8 is an inloine power filter optimized to use with components that require a C7 "figure 8" style IEC. Some of these components include: Mac Book Pro, Mac Book Air, laptop PCs, Subwoofers, Blu-ray DVD players and recorders, HD TVs, HD TV tuners, Cable and satellite TV tuners, Apple TV, PS3, AV amps, Network Audio Players, NAS and Active Desktop Speakers. The Flow-08 is a sophisticated finished inline power filtering unit that eliminates many common problems caused by contaminated electrical power lines. It protects against distortion caused by ground noise, voltage spikes and sags, high frequency power supply noise from other components in your own system, and finally high-frequency digital noise emanating from processors and digital interconnects. And while the Flow-08 is a star performer at eliminating common AC problems, it does it all without restricting current draw in any way. Furutech, known for its world-class Pure Transmission engineering, build and finish, have done the tests and the Flow-08 does not interfere with current draw. 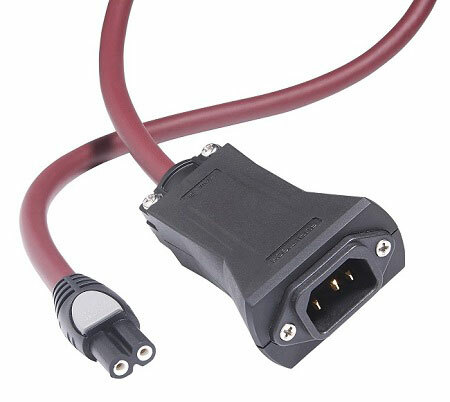 The Furutech model C7 IEC connector perfectly complements the remarkably effective Flow-08’s ability to eliminate distortion. The Flow-08 Inline AC Filter lowers noise on every component on which it’s used resulting in very natural and extremely fine resolution down and through the utterly silent noise floor. It improves soundstaging and imaging while creating nuanced high frequencies, an attractive, engaging midrange, tight and controlled bass, with power and dynamics to spare.